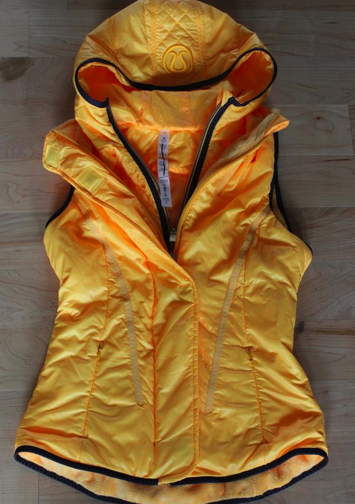 The new Glacier Vest debuted at the Lululemon 2013 Warehouse Sale in Vancouver this weekend in Black, White and Burning Yellow. Regular price is $158 but it was priced at $69 at the sale. Already I’ve seen several girls at the mall wearing the white and black version of this vest. I’m assuming we will see this uploaded on Monday night for the full price. The inside of this vest is lined in a furry almost sherpa fleece but it’s not as plush as the fleece on the Off The Mat Jacket or the Don’t Hurry Be Happy. It’s high pile but thinner knit fleece if that makes sense, so not as bulky. I considered getting one but the Glyde material looked really shiny in the black and white, much the same as the black Uba Hoodie Lux. I wear a vest often to Crossfit but since I have one I use (Peace Of Mind Vest) and I love it, I don’t need a second. There was also another new jacket at the warehouse sale called the Right Round Jacket, made to match the Right Round Pant, and it was pretty hideous. I know the retro track pant style looks great on a lot of you, but to me and on me it looked like old grandpa track pants. Well, the jacket is much the same with a long straight trench style fit with the stylings of a track Jacket. Same colors, color blocked stripes and material. Blech. Original price for that one is $148 -sale price was $69. I hated it, but someone is going to rock the hell out of it, I’m just not cute enough to make it work.